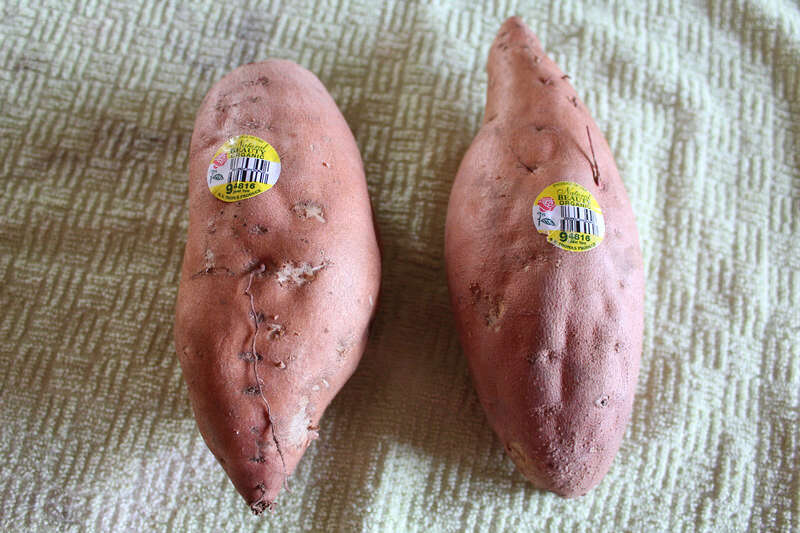 Have you ever wondered how to grow sweet potatoes? I absolutely LOVE sweet potatoes! They are not only incredibly healthy for you, but the sweet potato ranked #1 vegetable in overall nutrition in this study! Sweet potatoes are a good source of fiber and Vitamin A, but they also boast of Vitamin C, manganese, copper, pantothenic acid and B6. They can be enjoyed so many ways! I love them as a side dish with loads of butter and salt, but you can make quick breads, pies, casseroles and even stir-fry! Sweet potatoes are a member of the bindweed, or morning glory family. This explains the gorgeous vinery and flowers that they produce, so beautiful to look at! 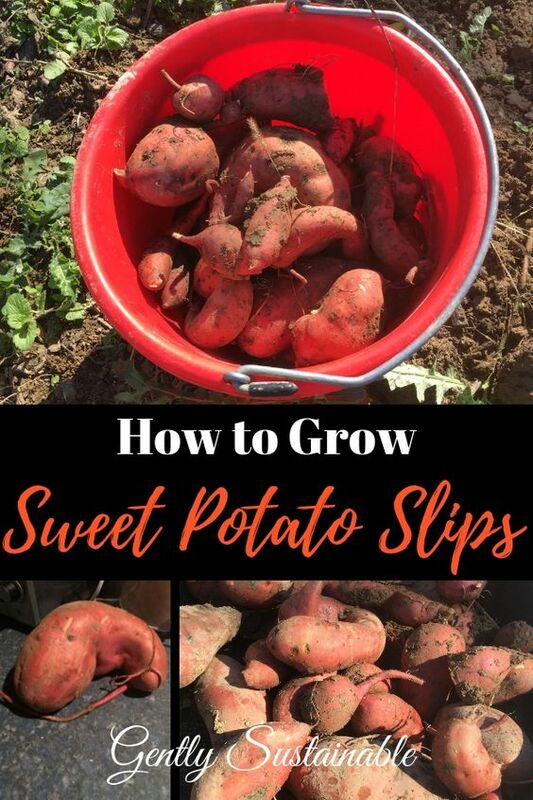 In order to grow slips, you will need…. -An organic sweet potato from last years crop, the grocery store or health food store. -A jar with mouth large enough to allow for sweet potato. Wash your potato/es with a mild soap to get off any dirt or bacteria. Dry well. 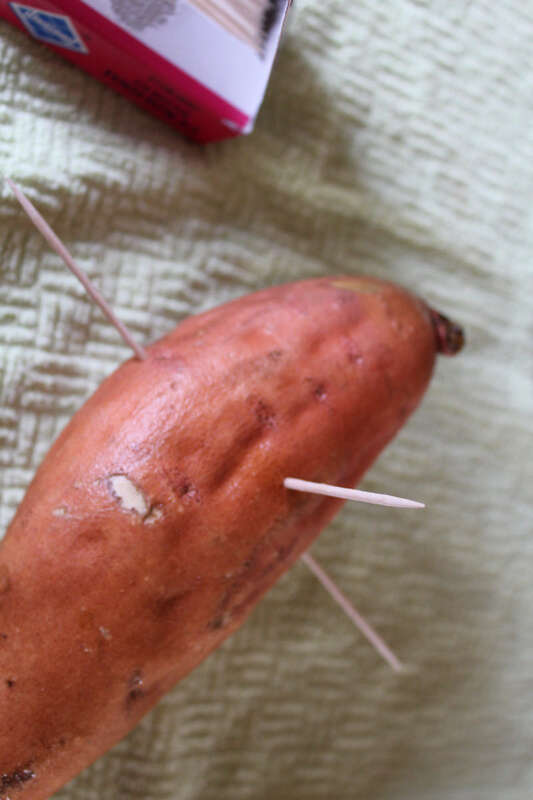 In a “T” shape, insert your toothpicks into the top half of the sweet potato. 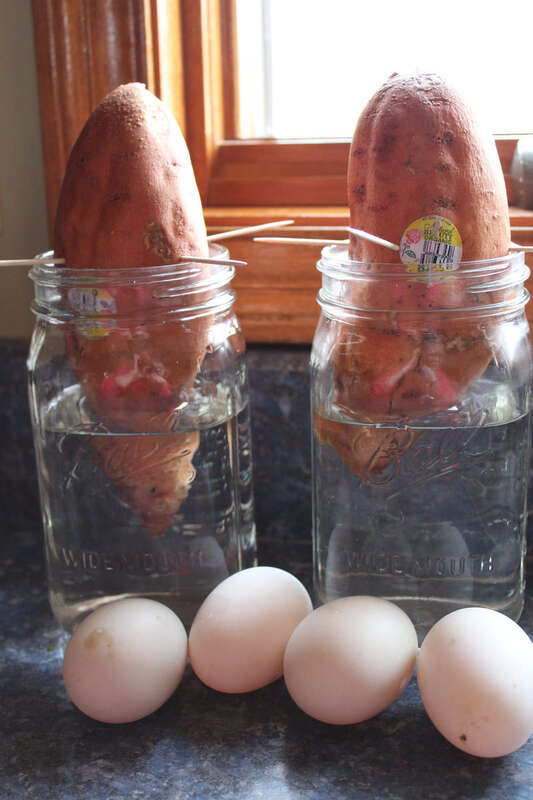 Next, fill your mason jar about 1/2 way with water and slowly place your sweet tater in there. If the water is a little too high, pour some out. The bottom fourth of the potato should be immersed. Every few days, replace the water. After a week or so, you should start to see little sprouts coming out of your potatoes! Exciting! So when the sprouts look something like this, pluck them off gently and put them in a jar of water by themselves, so that they can root. 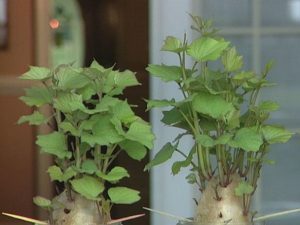 Once they have a good root system, they can be planted in soil, which will hopefully be your garden! Make sure the chance of frost has past before you plant outside. Otherwise, put your rooted slips in potting soil until it’s warm enough outside. Enjoy your sweet potatoes! How about starting some garlic inside now??? I am so going to try this for my garden this year. Found you on Simple Homestead Blog Hop. Candy, good luck! Let me know how you do with it! Hi Leah! This works really well, mine are just sprouting some roots out of the bottom of the potato, I expect the slips to appear next week! Good luck! My sweet potatoes from the grocery sprouted in the compost and I just planted the whole thing. Removing the slips seems like a better way to get a bigger harvest! Thanks for the info. Found you on the blog hop. Leilani, That’s awesome! Thanks for letting me know about your success! This is one of the clearest sweet potato slip tutorials .I’ve seen! Thanks for sharing it with us at the Homestead Blog Hop! I’ve done it the exact same way as you said and they’ve grown quite many roots so far but unfortunately the top seems to be drying out and is far away from growing any leaves like in your pictures, do you think they will develop when I put them in soil? Hi Amora! Are you keeping the water level consistent in your jar? This is important, especially if they’re drying out. Also, the jar may need a warmer place, do you have a radiator or a warmer window to put them? I don’t know what gardening zone you’re in but yes, they should produce slips from the soil as well, but in my zone 5, the last frost isn’t until late April. Check out this YouTube video and see how to do the soil method. Thanks for commenting! I’ve had a sweet potato in water a couple of weeks and roots are growing on the bottom, nothing on top. What’s up? Hi Diana! Don’t lose heart! A couple of tips- Keep the water level consistent and change the water every couple of weeks. Also, your potato might need more heat, can you place it near a heating vent or radiator? Hang in there, I think you’re on the verge of slips! I’m going to have to try this with my little girls! We LOVE sweet potatoes around here! I found you through the Homestead Blog Hop. Love your site, and I’ll be coming back for more! Hi Lacey! Kids love doing this! Thanks for reading and commenting! !